Background: EBUS guided trans-bronchial biopsy became routine in diagnosis of peripheral pulmonary lesions (PPL). Suction catheter-biopsy is a technique for obtaining a tissue sample from peripheral lung parenchyma. Aim of this study was to evaluate diagnostic efficiency, feasibility and safety of EBUS guided suction catheter-biopsy (SCB) in comparison to trans-bronchial biopsy (TBB) in diagnosis of PPL. The main intention was to demonstrate non-inferiority of the technique over trans-bronchial biopsy, especially when used under navigation of the EBUS. Methods: Radial EBUS probe (UM-3R, Olympus Co, Japan.) without guiding sheath was used to navigate suction catheter and TBB forceps to the PPL. The catheter was connected to the collection canister via vacuum pump. The SCB specimens were fixed with 10% buffered formalin. Results: There were 168 patients enrolled in this study; 69.9% males and 30.1% females. Main lesion diameter was 4.1±1.9 cm. Majority of patients, 131(77.9%) were diagnosed with lung cancer. Per-biopsy calculated sensitivity, specificity, positive predictive value (PPV) and negative predictive value (NPV) for EBUS-SCB were 92.4%, 100%, 100% and 67.7%, respectively. Corresponding values for EBUS-TBB were 92.3%, 100%, 100% and 69.7%. Only the size of the lesion significantly influenced (p=0.005) diagnostic performance. Complications occurred in 2 patients; one pneumothorax and one excessive bleeding. Conclusion: EBUS guided SCB is efficient, feasible and safe in diagnosis of peripheral lung cancer. The technique is complementary to trans-bronchial biopsy. There is an ongoing debate about the most efficient diagnostic procedure for histological or cytological diagnosis of peripheral lung lesions (PPL). 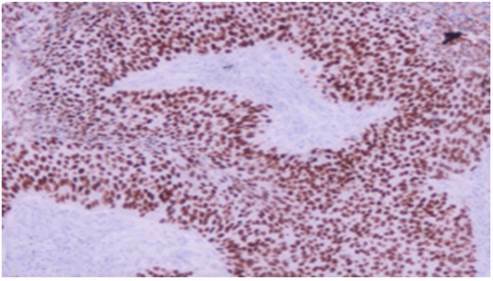 In an era when tissue, especially in molecular evaluation of lung cancer represents most valuable commodity, bronchologists are facing more and more demand not only for accurate diagnosis but also for sufficient amount of the tissue. Several options for accurate diagnosis of PPL are available in major respiratory centers. Usually it is necessary to choose between fluoroscopically guided bronchoscopy - transbronchial biopsy (TBB), CT guided transthoracic aspiration or radial EBUS guided bronchoscopic procedures. Fluoroscopically guided bronchoscopy or transbronchial biopsy shows variable success in diagnostics of PPL, ranging from 20-50%, depending on visibility of the PPL, size of the lesion and skillfulness of bronchoscopist. CT guided procedures have much higher diagnostic yield but usually provide only cytological samples which are insufficient for all genetic and molecular tests needed in diagnostics of lung cancer, with increasingly higher complication rate. Radial EBUS guided sampling techniques, on the other hand, have more advantages than both previously mentioned techniques [1-8]. Radial endobronchial ultrasound (EBUS) is a minimally invasive bronchoscopic technique, that expands the view of the bronchoscopist beyond the lumen of the airway. Endobronchial ultrasound guided tissue sampling techniques became almost routine diagnostic procedures in diagnosis of peripheral pulmonary lesions (PPL). 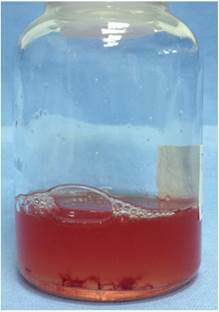 This technique also has a significant role in evaluation of the bronchial wall especially during assessment for treatment of early stage lung cancer. Diagnostic yield of radial EBUS in diagnostics of peripheral pulmonary lesions is high, leading to reduction in number of repeated bronchoscopies and diagnostic thoracotomies. Development of miniature radial EBUS probes, together with guiding sheaths and other guiding accessories allows access to smaller and more peripheral lesions. Radial EBUS can be used for placement of brachytherapy catheters or evaluation of distal bronchi in order to choose between different therapeutic bronchoscopic techniques for desobstruction [9-12]. Catheter biopsy is a bronchoscopic sampling technique for peripheral pulmonary lesions firstly described by German authors in late 1960's; followed by Swedish, Norwegian and Serbian authors in early 1970's [13-17]. Since then it had been long forgotten. However, with the rise of new technologies, such as EBUS or electro-magnetic navigation bronchoscopy (ENB) it became interesting again. Suction catheter sampling technique was usually used for obtaining a cytological tissue specimen. In our study we used modified technique of suction catheter biopsy, designed for collection of histological specimen. 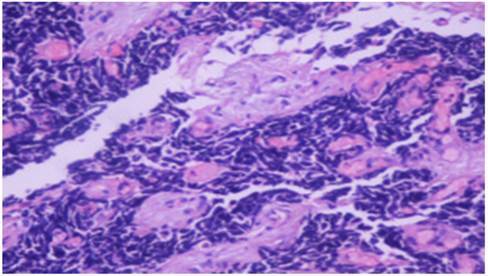 In an era of extensive genetic testing and molecular diagnostics of various respiratory diseases but mainly lung cancer, histological specimen becomes a prerogative [18-24]. Major aims of this trial were evaluation of safety and feasibility of radial EBUS guided suction catheter biopsy (SCB) in histological diagnosis of peripheral pulmonary lesions (PPL) and evaluation of diagnostic performance of radial EBUS guided techniques. Secondary aim was comparison between diagnostic efficiency of EBUS guided SCB and TBB and diagnosis of PPL. The study was a prospective, non randomized trial, conducted at the Respiratory Endoscopy Unit of the Clinic for Thoracic Oncology at the Institute for Pulmonary Diseases of Vojvodina in Serbia in the period from January 2011 to November 2012. It was approved by the institutional review and ethics board. All of the patients who decided to participate in the study were informed about the procedure, potential benefits and the risks, and all of them had signed institutional informed consent form. All of the patients screened for the enrollment were previously scheduled for routine bronchoscopy. Inclusion criteria for enrollment in the study were: age over 18 years, radiological proof of peripheral lung opacity, indication for bronchoscopy and peripheral lesion visualized by EBUS. Exclusion criteria were: patients who did not want to participate in the study, tumors visible during bronchoscopy, ECOG ≥3, recent myocardial infarction, unresolved coagulopathies, unstable angina pectoris, chronic heart failure (NYHA≥3), uncontrolled arrhythmia or hypertension and allergy to anesthetics. Prior to the enrollment in the study all patients must have had chest x ray, CT scan the thorax, spirometry, blood gas analysis, complete blood count and blood biochemistry. One hundred and ninety two patients were screened for the study, 168 of them met all the inclusion criteria, not having any exclusion. Bronchoscopy was performed in a dedicated respiratory endoscopy unit by bronchoscopists experienced in the use of radial EBUS, SCB and TBB. All procedures were performed in analgosedation. The routine vital parameters were monitored: non invasive arterial blood pressure, oxygen saturation on pulls oximetry, ECG for cardiac rhythm. Brochoscopic equipment used in the study was videobronchoscope BF-1T180 and BF-1TQ180 (Olympus Corporation, Tokyo, Japan), and video processor unit EVIS EXERA II (Olympus Corporation, Tokyo). Videobronchoscopy image was presented at a 19 inch LCD monitor OEV-191. Radial EBUS probe (UM-3R, Olympus Co, Japan.) without guiding sheath connected to EU-ME1 endoscopic ultrasound processor (Olympus Corporation, Tokyo) was used to navigate suction catheter and TBB forceps to the PPL. 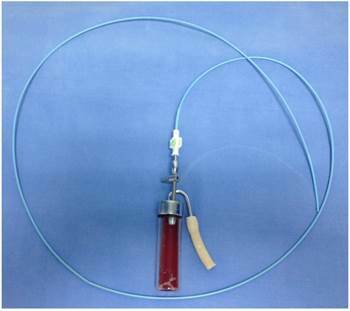 Radio opaque angiographic catheter MP-A1 (Super Torque ® plus) with an open end, 6F (2 mm) wide and 125 mm long (Cordis Corporation, Miami, FL, USA) was used for suction. The catheter was connected to valve/vacuum controlled sampling vial connected to the vacuum pump. Catheter connected to the sampling vial is presented in Figure 1. Figure 2 shows sampling vial with valve opening (arrow) which allows vacuum control by assistant nurse during suction. After the verification of the position and presence of peripheral lung lesion by radial EBUS probe the suction catheter was placed in the lesion. With several back and forth moves the peripheral tissue is slightly traumatized, aspiration by the suction catheter provides adequate quantity of tissue in the sample. One SCB sampling lasts for approximately 2-4 minutes, and during the sampling time sampling vial is constantly connected to the vacuum pump. Figure 3 shows usual amount of the tissue, sufficient for histological analysis sampled during SCB. One SCB specimen with sufficient tissue amount was obtained during EBUS navigated procedure, followed by at least three TBB specimens placed in the lesion after additional position confirmation by radial EBUS. Standard biopsy forceps (Olympus FB-19C), 120 cm long was used for EBUS navigated TBB. After the biopsy tissue samples were sent out to two pathologists blinded for bronchoscopic findings. The specimens of SCB were fixed with 10% buffered formalin on room temperature over night. After washing, tissue specimens were embedded in paraffin. Serial sections, 4-μm thick, were cut from each selected block, deparaffinized, rehydrated and stained with hematoxylin and eosin. Descriptive statistics were generated for all study variables, including mean and standard deviation (SD) for continuous variables and relative frequencies for categorical variables. One sample Kolmogorov-Smirnov test was performed for testing the goodness of fit with the normal distribution. McNemar test was used to compare the diagnostic sensitivity and specificity, and statistically significant differences between categorical variables. Sensitivity and specificity, positive and negative predictive values of EBUS guided SCB and TBB in diagnosis of PPL were calculated. All probability values were calculated by assuming a 2-tailed α value of 0.05 with confidence intervals at the 95% level. All statistical analyses were performed with SPSS for Windows version 15.0 (SPSS Inc., Chicago, IL). There were 168 patients, 117 (69.6%) male, and 51 (30.4%) female with average age 62±7 years included in the study. Patients were mainly current and former smokers, 107 (63.7%) and 46 (27.4%), respectively. There were only 15 (8.9%) non smokers. Majority of lesions were situated in the right upper lobe (39.9%). Demographic characteristics are given in table 1, while most common localizations were given in table 2. Final bronchoscopic diagnosis confirmed lung cancer in 131 (77.9%) patients, pneumonia was diagnosed in 26 (15.5%), tuberculosis in 7 (4.2%), while normal histological/non-specific tissue was confirmed in 4 (2.4%) of all cases. EBUS guided techniques confirmed the diagnosis in 164 (97.6%) patients. Four patients in whom radial EBUS visualized lesions and confirmed normal histology of lung parenchyma, were followed during 3 months period. In one patient video-assisted thoracotomy was performed and confirmed tuberculoma. Three patients had lesion / opacity in the middle lobe, which significantly decreased or vanished during follow-up period. Most frequent peripheral pulmonary lesion localizations. Among patients with final diagnosis of lung cancer, majority were diagnosed with adenocarcinoma 68 (51.9%), squamous cell lung cancer was confirmed in 40 (30.5)%, small cell lung cancer in 12 (9.1%) and other malignancy in 11 (8.3%). Most patients with lung cancer were diagnosed in advanced stage, stage IIIB was confirmed in 16.1%, while stage IV was diagnosed in 24.4%. Stages IA, IB, IIA, IIB, and IIIA were diagnosed in 7.7%, 14.3%, 6%, 6%, and 25.6%, respectively. Average size of the peripheral pulmonary lesions was 4.1±1.9 cm. In the multivariate analysis only the size of lesions significantly influenced diagnostic performance (p=0.005). Neither one of the investigated parameters has been found to significantly influence diagnostic performance of radial EBUS. Biopsy based sensitivity and specificity of EBUS guided suction-catheter biopsy were 92.4% (95%CI: 89.51%-94.72%) and 100% (95%CI: 94.74%-100.00%), respectively. Positive predictive value (PPV) and negative predictive value (NPV) for EBUS-SCB were found to be 100% (95%CI: 99.08%-100.00%) and 67.7% (95%CI: 57.66%-76.57%). Negative likelihood ratio (NLR) was found to be 0.08 (95%CI: 0.05%-0.11%). Sensitivity and specificity of EBUS-TBB were 92.3% (95%CI: 89.34%-94.63%) and 100% (95%CI: 95.21%-100.00%), respectively. Positive and negative predictive value were 100% (95%CI: 99.06%-100.00%) and 69.7% (95%CI: 60.19%-78.16%), respectively. Negative likelihood ratio was 0.08 (95%CI: 0.06%-0.11%). All the corresponding values are given in table 3. Complications occurred only in 2 (1.19%) patients. Several recent trials evaluated diagnostic efficiency of bronchoscopic suction catheter sampling. Almost all of these trials were evaluating suction catheter in cytological diagnostic setting. Our trial confirmed high diagnostic yield of EBUS guided SCB and TBB. High sensitivity, for SCB 92.4% and for TBB 92.3% can be attributed to the selection of patients, we included only patients with EBUS identified and visible lesions in comparison with other trial which included all patients. In a trial by Peschke  et al overall 272 patients were included, catheter aspiration confirmed the diagnosis in 51.5% while TBB confirmed diagnosis in 50%. SCB used in our trial is a modification of described method, the only difference in our sampling technique is preparation of the tissue for histology examination. Peschke et al. used fluoroscopy for navigation to the lesion which could explain lower diagnostic yield than observed in our trial. For lesions larger than 4 cm, catheter suction showed significantly higher yield (62.4%) compared to 56.9% for TBB. It is obvious that suction catheter has very good potential for larger lesions. Similar data could be drawn from our trial in which the mean diameter of the lesion was around 4 cm. One of the most comprehensive trials on catheter aspiration was reported by Franke et al . That trial evaluated 51 patients with lesions larger than 3 cm in majority of subjects (66.6%). Authors used fluoroscopically guided suction aspiration and confirmed diagnosis in 75% of patients while TBB confirmed diagnosis in 44%. In this trial suction aspiration had significantly better yield (p<0.01) than TBB. We did not observe significant difference between two sampling techniques, which both had better diagnostic yield than in Franke's study. Higher sensitivity in our trial (92.4), when compared to Franke's (75%) could be explained by radial EBUS guidance in our trial. The most advanced and maybe most comparable trial to ours was published by Eberhardt et al . Eberhardt used more advanced navigational technology of electromagnetic navigation bronchoscopy (ENB). However, EBUS was used to verify the accuracy of target lesion localization by ENB. The overall diagnostic yield of suction catheter in Eberhardt's study was 93%, which is completely comparable to 97.6% in our trial, both were calculated per lesion/per procedure with addition of EBUS. That trial found significantly higher yield in suction catheter versus TBB when ENB was performed. More or less our trial is only confirming this high yield of Eberhardt's study. With only one exception, Eberhardt was diagnosing lesions less than 3 cm in diameter and in our trial lesions were almost 1 cm larger in average. Complication rates in both trial are also comparable, 1.95 in Eberhardt's trial and 1.19% in ours. Kokkonouzis et a  published one of the most recent trials on usefulness of radial EBUS in diagnosis of PPL in general hospital setting. Authors performed retrospective evaluation of 40 patients. Diagnostic yield was 87.5% for lesions larger than 3 cm, and diagnosis was obtained using variable techniques of sampling including TBB. One additional trial was reported by Sivokozov et al  and confirmed ability of EBUS to localize the lesion and obtain TBB in 89.5% of patients. Both trials used per patient sensitivity, in our trial per-procedure (SCB and TBB) calculation was made. But success rate of these trials is within the confidence interval recorded in our study. Study published by Tay et al  identified lesion size, malignancy status and distance from hilum as important and significant predictors of EBUS visualization yield. Diagnostic yield for lesions visualized by EBUS was 65%, lower than in our trial 97.6%. The fact that we included only patients with visualized lesions and that majority of patients had lung cancer could influence high overall diagnostic yield and sensitivity of EBUS guided sampling techniques in our trial. Overall diagnostic yield of EBUS guided TBB in a trial published by Hsia et al  in 2012 was found to be 65%. Higher sensitivity was observed in non-malignant disease (81%) when compared to malignancy diagnosis (71%). These high sensitivities are close to the confidence intervals we reported (89.3-94.6). One of the largest retrospective trials was published in 2013 by Fuso et al . The authors evaluated 662 patients with average size of the lesion 3.6±2 cm, comparable to the size in our group. Lesions were visualized by EBUS in 75% of patients. EBUS guided TBB had sensitivity of 71% for diagnosis of lung cancer, with NPV of 46% and overall diagnostic accuracy of 77%. In our trial success rate for malignant disease was not extrapolated from merged results, however sensitivity of EBUs guided TBB was 92.3%, NPV 69.7% and overall diagnostic accuracy over 97%. Again, our results are calculated according to protocol which included only visualized lesions. Both trials however, confirm high diagnostic yield of EBUS guided TBB in diagnosis of PPL. There are several trials which call for caution in regard to diagnostic significance of radial EBUS in diagnosis of PPL [26-28]. One of the most recent trials compared diagnostic performance of radial EBUS and CT guided percutaneous core biopsies . In 57 patients with mean lesion size 29±16 mm diagnostic sensitivity of EBUS guided sampling was 67%, in comparison to CT guided biopsy (78%). Even though the difference is not statistically significant sensitivity is obviously lower. Sensitivity for malignancy was also lower in EBUS group (74%) than in CT guided biopsy (88%), again without statistical significance. However, CT guided biopsy had significantly higher diagnostic yield for lesions less than 2 cm in diameter. The only foulness of CT-guided biopsy is significantly higher rate of pneumothorax. Lower complication rate in terms of pneumothorax might go in favor of radial EBUS, as demonstrated by this trial. We reported only one pneumothorax in our trial. A randomized trial of EBUS guided sampling techniques in diagnosis of PPL published by Roth et al  evaluated primarily cost-effectiveness of different EBUS guided sampling techniques. This trial conducted on 264 patients with suspected lung cancer concluded that radial EBUS guided techniques do not increase detection rate for cancer in PPL when bronchoscopy is performed by bronchoscopists at all levels of expertise. Even though diagnostic effectiveness of EBUS guided sampling is confirmed by majority of trials and recent meta-analyses, further studies are needed to confirm its role in the evaluation of PPL. [29,30] The samples were also sent for molecular testing. 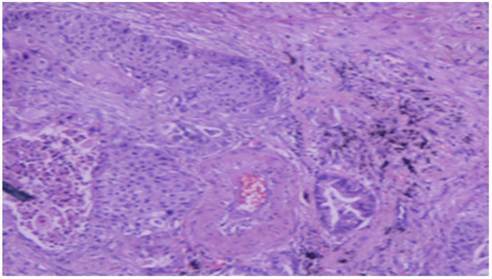 This study proved high diagnostic yield of EBUS guided SCB and TBB in diagnosis of peripheral lung lesions. EBUS guided suction catheter biopsy is feasible, safe and accurate in diagnosis of PPL. High sensitivity and specificity reported in this trial are comparable to previously published results. Suction catheter biopsy could be regarded as valuable technique, simple and readily available for routine use in EBUS guided bronchoscopic diagnosis of peripheral lesions.